Salt Lake City, UT. 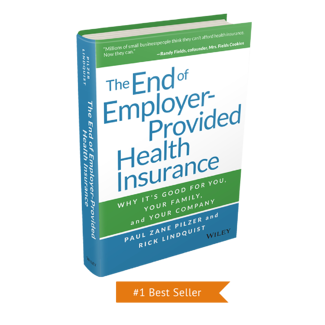 Zane Benefits, Inc., which helps businesses reimburse employees for individual health insurance plans, announced today its Amazon #1 Best-Seller, The End of Employer-Provided Health Insurance: Why It’s Good for You and Your Company - now available at all major retailers. The book predicts that, over the next 10 years, 100 million Americans will move from employer-provided to individually purchased health insurance. 1. Insurance agents, CPAs, and financial consultants. Part I explains why the end of employer-provided health insurance is inevitable. 2. Employees of all U.S. companies. Part II is a consumer’s guide to navigating the new individual health insurance market. 3. Owners of small and medium-sized businesses. Part III is an employer’s guide to transitioning to defined contribution healthcare and individual health plans. According to the Amazon.com listing, the techniques outlined in the book will help consumers and employers save money on on health insurance by migrating from employer-provided coverage to employer-funded individual plans at a total cost that is 20 to 60 percent lower for the same coverage. According to Lindquist, this parallels a similar shift in employer-provided retirement benefits that took place two to three decades ago from defined benefit to defined contribution retirement plans. A sample of the book is available for free at www.zanebenefits.com/book. Zane Benefits is the leader in individual health insurance reimbursement for small businesses. Since 2006, Zane Benefits has been on a mission to bring the benefits of individual health insurance to business owners and their employees. Zane Benefits' software helps businesses reimburse employees for individual health insurance plans for annual savings of 20 to 60 percent compared with traditional employer-provided health insurance. Today, over 20,000 customers use Zane Benefits' software, services, and support to reimburse individual health insurance plans purchased independent of employment. Zane Benefits' software has been featured on the front-page of The Wall Street Journal, the USA Today, and The New York Times. Learn more at www.zanebenefits.com. The #1 Amazon Best-Selling End of Employer-Provided Health Insurance is a comprehensive guide to utilizing new individual health plans to save 20 to 60 percent on health insurance. Over the next 10 years, 100 million Americans will move from employer-provided to individually purchased health insurance. Written by a world-renowned economist and New York Times best-selling author, this insightful guide explains how individual health insurance offers more to employees than employer-provided plans. Learn more and join the debate at www.healthinsurancerevolution.org/book.